While growing up, there were numerous images that I came across of snow clad peaks as a reference point for mountains. 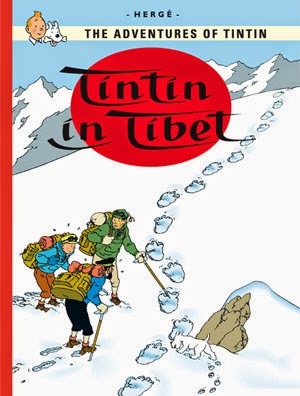 But only when I got my hands on “Tintin in Tibet” that I grew fond of the Himalayas. Away from conventional villains and car chases, this adventure takes Tintin into the heart of Himalayas on a wild goose chase of his friend Chang. Characters like Sherpa, Monks and adaptations of the Buddhist culture through the Monasteries, Prayer Flags and Stupas added another degree of fascination. Ever since I learnt about Royal Enfield groups heading to Ladakh on road trips, I became extremely excited to put this destination on my bucket list. However, there was no way that I could convince my folks back in school to let me do this. For the last 4 years, me and my wife have been planning a trip to Ladakh between June and August. But this year, thanks to our friends, we finally managed to make this trip. Since we dint have the liberty to take a longer break, we decided not to look at a road trip and rather take a flight straight to Leh. Leh was once a capital of kingdom of Ladakh, but now it is a district in the state of Jammu and Kashmir. Day 1 – Take an early morning flight to Leh. Ensure you pre-book a window seat to enjoy the view of the mountain peaks and valleys before the flight lands. Kushok Bakula Rimpochhe Airport is a pretty small airport and is just 10 mins away from Leh market. You can take a pre-paid taxi from a counter at the airport which is readily available. It costed us INR 250 for a ride to Oriental Hotel. Spend the day resting and avoid any physically stressful activity. There is a strong chance that you can easily get dehydrated and it is advisable to regularly have sufficient amount of water to stay hydrated. If you have plans of having a liquor party, please put it at bay for Day 1 and 2 atleast. In evening, you can take an easy walk down to the market to explore some of the eateries and also speak to a few travel agents for planning your trips ahead. 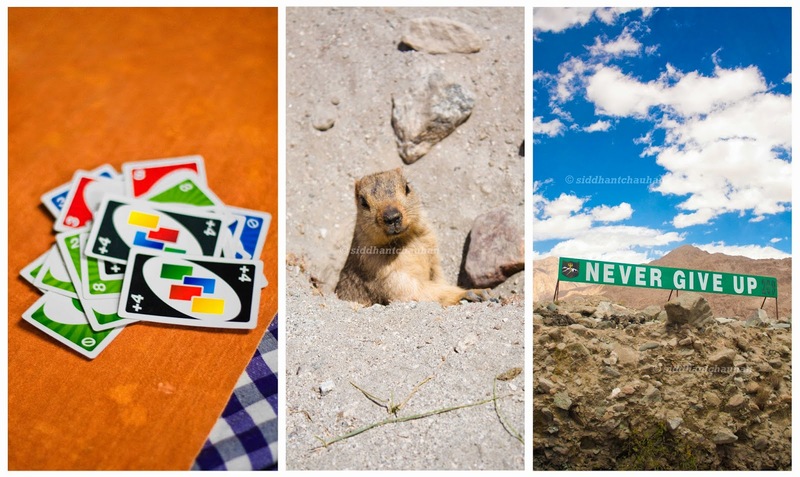 Day 2 – You can look at planning an easy trip to places around Leh. We had headed out to visit Lamayuru Monastery in Kargil district at approx. the same altitude as Leh. The 11th century monastery is known to most for their annual masked dance festival. It takes approx. 3 hours to cover the distance of 74km. On the way, you can also stopover to view the sangam point of Indus and Zanskar river, moon land and also at the magnetic hill where you can witness your vehicle tread uphill without even stepping the accelerator. At the monastery, you can ideally spend 45 mins to an hour. On the way back you can also take a detour and visit Alchi Monastey, which is almost a century older than Lamayuru. You can add another 1.5 to 2 hours to your journey if you plan to visit Alchi. 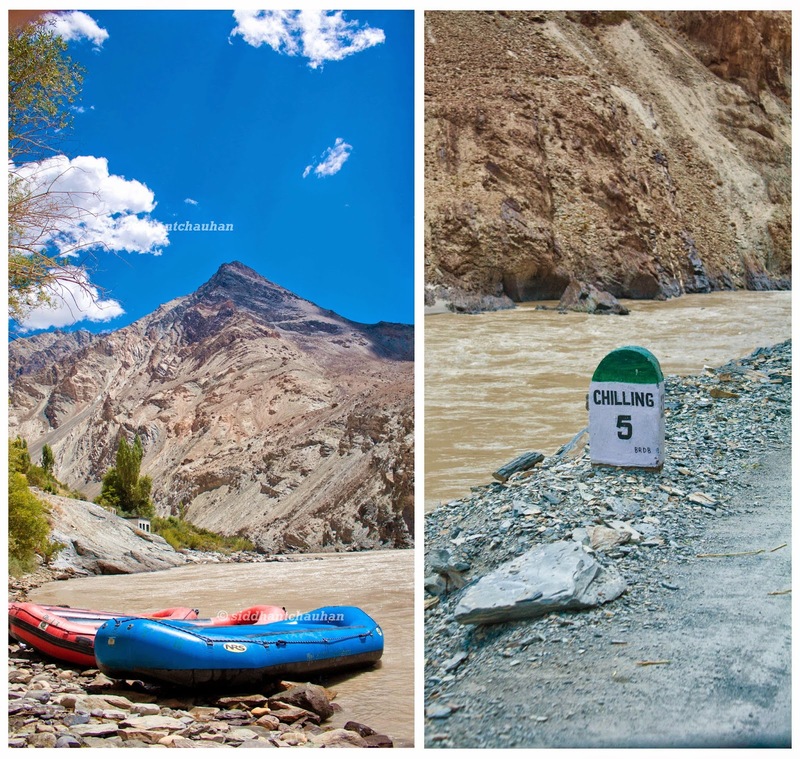 Day 3 – We were extremely excited for this day as we had planned for a rafting trip in Zanskar. It is the same river, which forms the frozen base for the gruelling Chaddar Trek during winters. The tour operator picked us up at 8:00 am from our hotel and we began our 66 km trip to Chilling, the starting point of the rafting stretch. The stretch of 30 kms between Chilling and Nimu (meeting point of Indus and Zanskar) comprises of grade 3/4 rapids and takes almost 3 hours to complete. This leg of the adventure trip will surely require you to be attentive and dispel a lot of energy to cruise past through some tough rapids. On the way back, we visited Hall of Fame Museum at Leh which briefly gives you a view into the cultural heritage of Ladakh and largely pays a tribute to the brave soldiers who displayed true valour on duty. 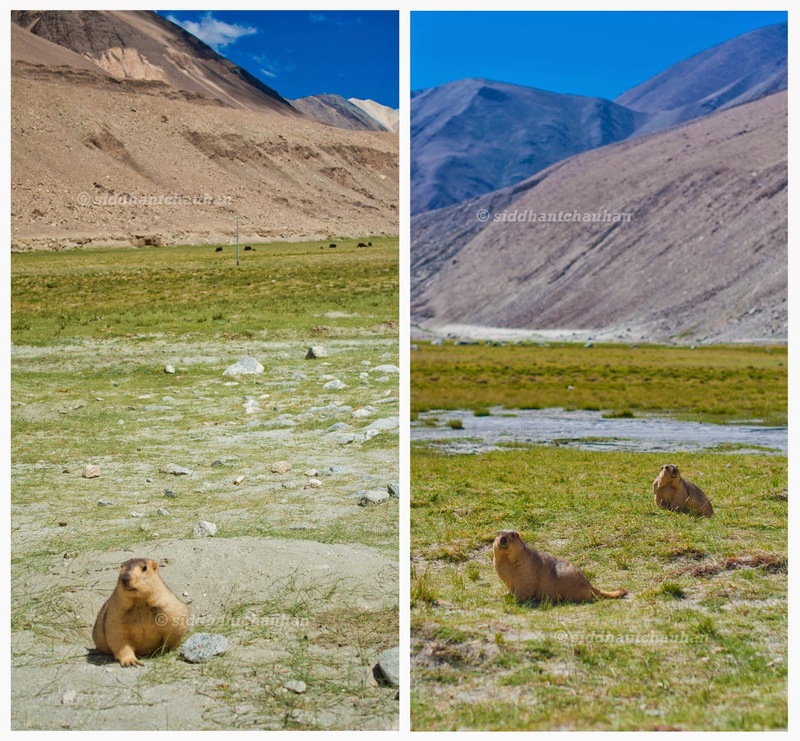 Day 4 – This was the day we aimed to head to Nubra Valley. However, owing the food poisoning the previous night, we had to take a tough call. We couldn’t let the plan of the entire group dampen and we decided to stay back for medical help and recovering. Again, some medical advise helped in recovery and we were set to leave early morning the next day. Day 5 – In order to beat the traffic and stay clear of the military convoy, we left early morning to cover the long journey to Nubra Valley. 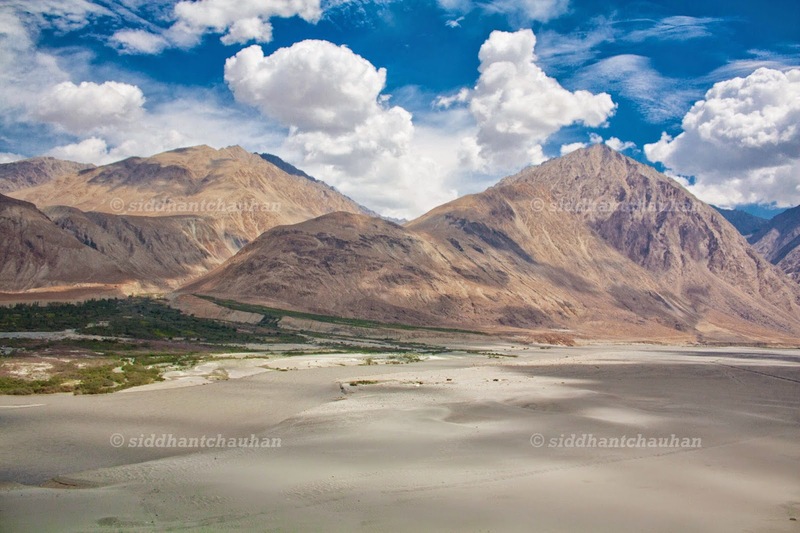 Almost 150 kms from Leh, Nubra is a high altitude desert at 10,000 ft. On the way, you cross the high mountain pass Khardung La which claims to be the world’s highest motorable pass at 18,379 feet. The way beyond the pass is beautiful but takes a lot of steep turns to get your motion sickness meter up. It took us 4.5 hours to reach Nubra. We decided to meet the group at Hundar for the Camel Safari, however, owing to silly confusion and zero network connectivity we missed each other by a whisker. There was a strong sand storm brewing up and we barely managed to get a camel ride with our eyes closed and consuming almost a few grams of sand. 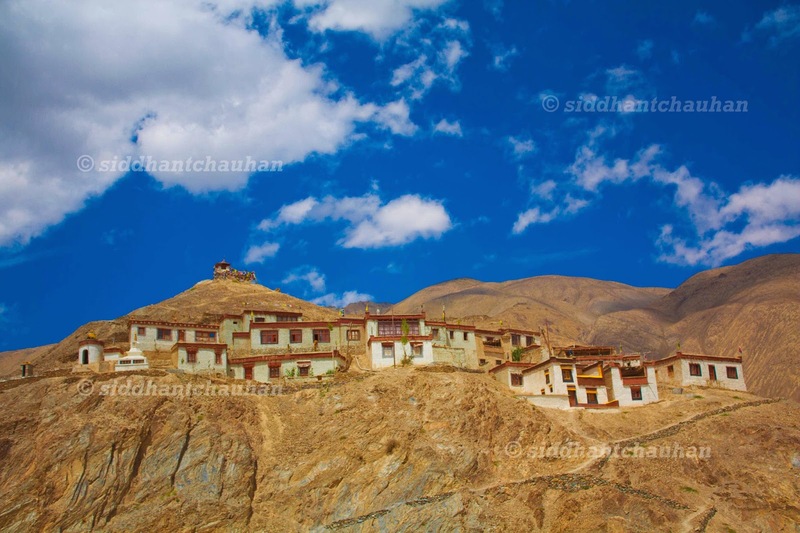 Diskit is the capital of Nubra and is also the home of the oldest and largest Buddhist Monastery. We skipped this, and headed straight to our camp Mystic Meadows in Sumur. On the way we also reunited with our group in the most unexpected locations. We had the option of going for the hot springs, which our friends had covered the previous evening, but after a long day we decided to spend the remaining time at ease over dinner, card games and conversations. Day 6 – Today we head back to Leh and since we left early, we managed to beat the traffic. This time around as we were approaching Khardung La pass, we experienced snowfall for the first time in our lives. The view got prettier with every rising feet. This time around we stopped over for some mint tea before proceeding ahead. Checked in back into our hotel and then in the evening ventured out to explore the local market. Sealed the day with dinner at Il Forno on Zangsti road with some thin crust pizzas. Day 7 – Finally we are heading towards the last leg of our journey. Considering the number of beautiful pictures we had seen of Pangong Lake, we were super excited to finally see it for real. The first view of the deep blue water between the hills was breath-taking. Pangong Tso is at an altitude of 14, 270 feet and around 170 kms from Leh. Extending upto 134 kms between India and China, 60% of the lake lies in Tibet. On the way we crossed Chang La pass, but decided not to stop over as we were stuck in a convoy of trucks. We stopped over at the point where Marmots are spotted. But with a lot of people around us who unnecessary stressed them out, the Marmots were not too comfortable staying out of their burrows for too long. 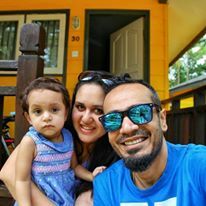 After relishing the beauty of the lake and meeting the cute rodents, we headed over to our camp. There are quite a number of operators who have their camps adjacent to each other. The temperature here was definitely freezing and the cold winds made it more severe. Day 8 – The plan was to wake up early morning to witness the sunrise. However, since the hills obstruct the view of the horizon, what we could witness was the changing colour of the peaks around Pangong Tso lake. After grabbing our breakfast, we headed back to Leh. This time we managed to spend some quality time with the Marmots as they also seemed to be in a relaxed state. Later in the journey, we decided to stop over at Chang La pass (17,590 feet) to pay a visit to the Changa La baba temple and relish some Maggie with mint tea. Though this was the 4th consecutive day we were traveling on road for atleast 4 hours, we also knew that this was the end of our journey to Ladakh. In the evening, we explored the market, grabbed our dinner and retired to bed. Pangong tso lake view is truly mesmerizing. Can’t imagine how it would be to visit this place in person. Nature at it’s best..
Ladhak is something that is on my list! You have detailed out a great plan. Bookmarking it. Absolutely stunning pictures. This is a long due travel goal for me and I really need to get around to going there. Love the post! Oh wow😍😍 What a great post.. I wanna go to Ladakh right away! Its on my bucket list and I am pestering my husband to plan. Thank you so much for this post very helpful. I always thought its impossible to cover ladakh in 9 days!! I have been meaning to go to Lek as well as Ladakh for long now. Reading this makes me want to plan soon. Great write up!